Well, I wanted to write something that was hot off the press and of the moment and the opportunity has finally arrived! Nearing the end of our time on La Grand Terre, the main island of the archipelago here in New Caledonia, we had arranged to stay in a fairly out of the way tribal village by the sea in an area known as ‘The Forgotten Coast’. Before setting off from the last major village we had called in at the Tourist Office to gather last minute information. It was then we learnt that a Cyclone ‘pre-alerte’ had been issued for the northern part of the island, a few hundred kilometres from where we were. We were advised to keep up to date on the storm’s movements and to ring or get local updates if things deteriorated. It was a 36-kilometre drive hugging the coast for the most part with a few deviations inland to circumnavigate a mountain or large river. There were several bridges and four low water crossings or causeways: the latter allow for the average low water flow and in times of high water the water flows over the roadway sometimes impeding vehicular crossing. The day had been cloudy and as night began to fall a light but persistent rain was falling. The village was simple and remote. Tin roofed buildings for the most part all spread out beneath palm trees and pines. As we drove in a large metal sign informed us that we were in a tsunami zone and what action to take if needed. We dined on octopus cooked by our Kanak hostess Julia with a charming Canadian family and one set of their parents. As the papaya dessert arrived Julia informed us that the cyclone alert had gone to a Stage I: this meant a strong possibility that a storm could hit within 18-hours and to take the initial steps to secure all loose items around one’s property and prepare for the eventuality of a power loss. During the night the rain set in properly. A relentless cascade resonating on the thin tin roof and pouring off the un-guttered eaves onto the ground. We both awoke at first light to a world awash with water and with more pouring out of the sky by the minute. The Canadians were also awake and watching the deluge. Julia arrived and told us that at midnight the cyclone alert had gone to Stage II: meaning the storm was within 6-hours of hitting and to make all last minute arrangements and batten down the hatches. There was no news on the state of all the river crossings but Julia thought that they would still be passable but would not remain that way for much longer. We had a flight to catch the following day and the Canadians also had commitments on the other side of the island. We all decided to go in convoy with the proviso that nobody would attempt a crossing if the water looked too high. Their children were in remarkably good spirits as cars were loaded, their grandparents less so. The father was a competent looking man and together I felt that we stood a pretty good chance. My only concern was that on our side we had the smallest and lowest car of all, a rather under-powered Peugeot 107. Nonetheless, it had got us across 15-kms of fairly remote and unpaved mountain road the day before and I had a reasonable amount of faith in its road holding ability but would have preferred a diesel engine to the petrol. So, engines were fired up, headlights went on as did windscreen wipers on full speed. Allons y! Out on the road there was a lot of surface water, some palm fronds and the odd branch. The sea was more agitated than the day before but did not look too foreboding, possibly because we were sheltered by the offshore reef which rings the whole island. Visibility was fair but the rain by now was coming down in great liquid whips and the numerous potholes, or ‘nids de poules’ as they are known here, were best avoided if possible. Gunning the stout 107 between second and third gears we drove as fast as was possible on the deserted road beside the coast. 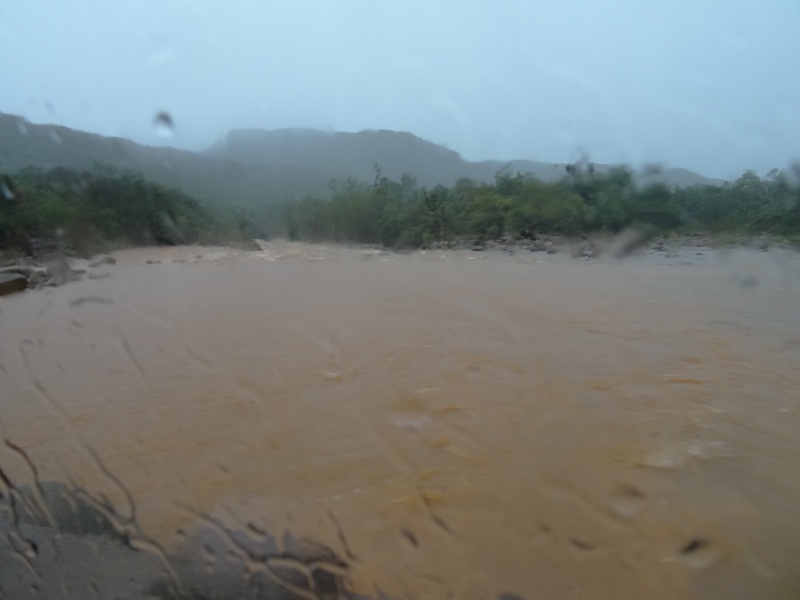 Water was pouring off the mountains, filling the ditches with angry red water which spilled frequently onto the road. Slowing for each large puddle whilst keeping the revs high we made good progress and then came to the first river crossing. The low water bridge was already underwater. Stopping, Grace jumped out and waded into the water to test the depth. It was only a couple of inches above her well-turned ankles and although flowing steadily did not have a dangerous look to it. After a quick nod all round the signal was given to go. First in line, I rolled slowly forward, aware of the drop off on my right-hand side. Keeping the revs high again I moved forward with the gentlest of bow waves and rode up and out the other side. The others followed and off we went again. 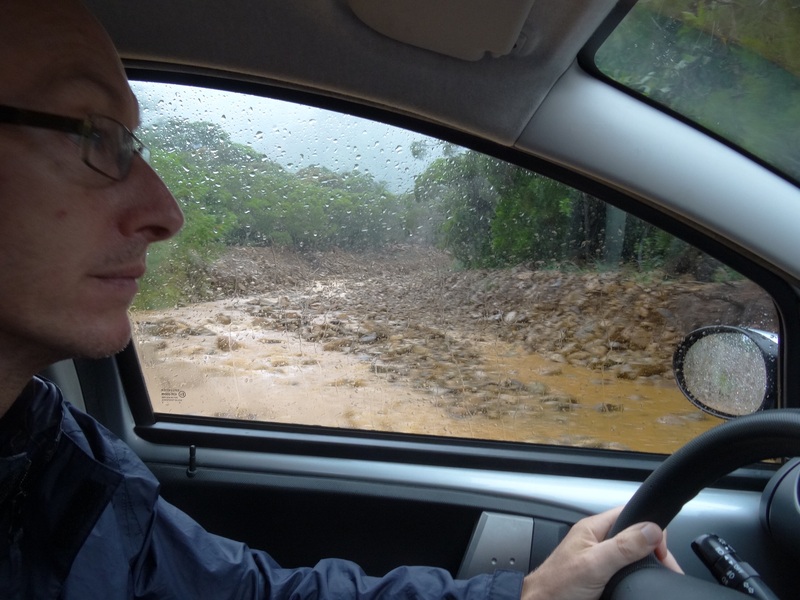 A lot more puddles were appearing now and several sections of unpaved road were greasy with mud. After one corner a large coconut in the road necessitated a quick turn of the wheel and a slight drift but otherwise we were covering the ground. Winding up into the mountain we could see the full extent of the downpour with cascades dotted all over the forested slopes. Rounding one bend a rockfall had spewed across the road needing a quick zig and a zag to negotiate. Downhill was greasy again but the 107 was going great guns, slight drifts and a tendency to ‘tram line’ some of the storm water runoff channels appearing on the unpaved sections. The next river crossing was clear but not far off bubbling over and this was a much more ominous looking body of red water boiling down towards the sea. The third and fourth river crossings passed without incident and we were on the home straight. The 45-minutes had passed amazingly quickly, or so it seemed, and when the small harbour and the village came into view we felt very glad to be back in touch with the rest of the island. We bid goodbye to the Canadians and after a few telephone calls to rearrange accommodation drove much more sedately across the island to the west coast. I am writing this from the unexpected comfort of a converted shipping container in a garage where Grace and I will pass our last night on the island as guests of the delightful Sonia from La Reunion and her Tahitian husband. A creole meal is in the offing and I think perhaps a glass or two of wine are in order. I would like to thank the makers of the Peugeot 107 for having produced such a robust and remarkable emergency evacuation vehicle and wish to apologise to the car itself for having at times cursed its lack of power – I think it just needed to be driven a little harder in order to get the best out of it. As for the cyclone at the moment it is battering the East coast but the latest is that it is deteriorating in force as it moves southwards. Let us hope it fades out totally before it reaches New Zealand otherwise we may rejoin it some time tomorrow afternoon! This entry was posted in South Pacific, travel and tagged Adventure, Cyclones, driving, Escape, New Caledonia, Storm, travel by Ashby's World. Bookmark the permalink.